The word 'lite' always had a negative connotation as a toned-down item or a lower end product. Some of us may even associate the 'cheap' with the word 'lite'. Even so, there has always been a need for value products in every market; as many people would prefer not to spend so maximum money on everything they buy. Especially in such tough economic times, there would be an increase of people who choose to spend wisely and efficiently to make the best out of their money. For Thermaltake, "Lite" also has another meaning. The company's Litepower series power supplies are also marketed as energy efficient and "green". Interestingly, APH haven't reported on a power supply for about a year already, and we are getting back into it now! Today, we will be taking a look at the Thermaltake Litepower 450W -- a budget line of power supplies by the well known manufacturer of cooling products, Thermaltake. 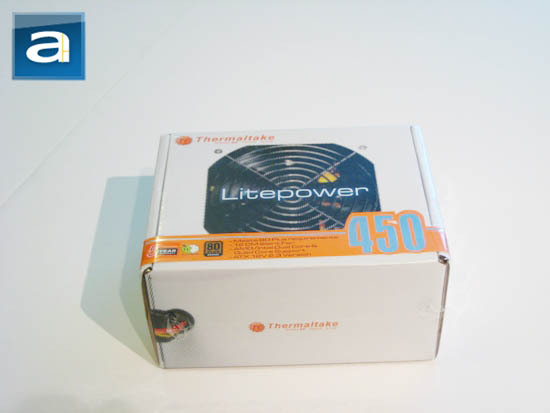 We'll also crack open this power supply to see what is the symbolic significance of 'lite' means to Thermaltake when they designed and manufactured our Thermaltake Litepower 450W power supply. 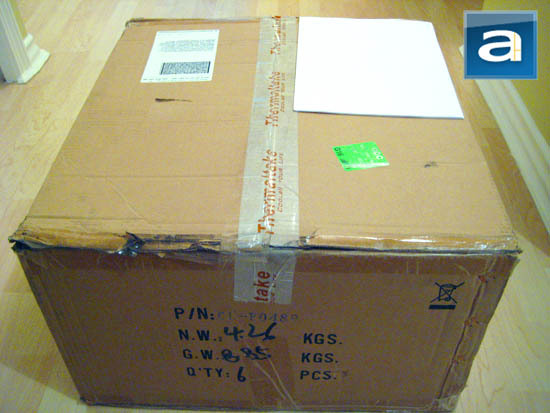 Our test unit came in an large, oversized corrugated cardboard from Thermaltake's offices in California, USA. As usual, UPS Standard was used for shipping; this time the box was slightly damaged during transport. It appears that someone working at UPS might be trying out for soccer and used our package for practice, haha. Thankfully, the contents of the box were still in perfect condition; interesting with only a piece of cardboard to prevent the items from shifting around inside. 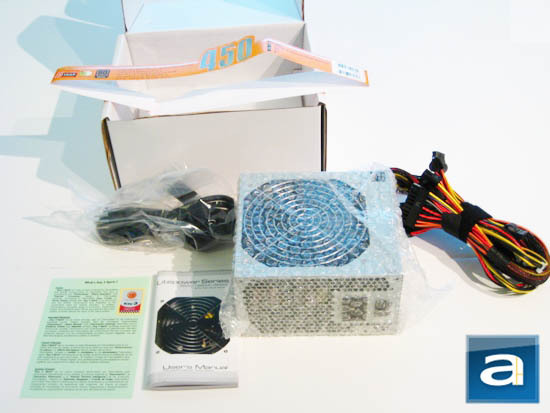 There were two products in the box -- our Litepower 450W being looked at today, and a Thermaltake TMG IA1 which we will be reviewing very shortly. As usual from Thermaltake, the Litepower PSU came in retail packaging. Similar to their Thermaltake Toughpower Cable Management 650W, they used a cleaner design with a white, orange and black color scheme. Very creatively, they decided to have the box image designed as if it was a power supply itself. If you look closely, you can see the cables on the left flap, and the power supply fan at the top of the box. The side opposite to its cables also features a printed image of the mesh, power adapter, and power switch. The box was overall pretty compact, and has little room to spare on the sides when opened. No material wasted, and reduces shipping weight. I like it! The bottom of the Litepower box shows all the features and outputs of this Litepower PSU. Standard to Thermaltake's designs, there's a big Thermaltake logo and 'Litepower' words on the bottom that dominates majority of that surface. It also shows the various certifications and standard recycling logos. Instead of placing each and every specification detail on the box, they opted to tell users to go to their website for more information on the Litepower 450W, or look on the included removable orange border for other details.